This topic describes how to configure ASP.NET Web API. Web API configuration settings are defined in the HttpConfiguration class. DependencyResolver Enables dependency injection for controllers. See Using the Web API Dependency Resolver. IncludeErrorDetailPolicy Specifies whether the server should include error details, such as exception messages and stack traces, in HTTP response messages. See IncludeErrorDetailPolicy. Initializer A function that performs final initialization of the HttpConfiguration. ParameterBindingRules A collection of rules for binding parameters on controller actions. Properties A generic property bag. Routes The collection of routes. See Routing in ASP.NET Web API. Services The collection of services. See Services. Visual Studio 2017 Community, Professional, or Enterprise edition. 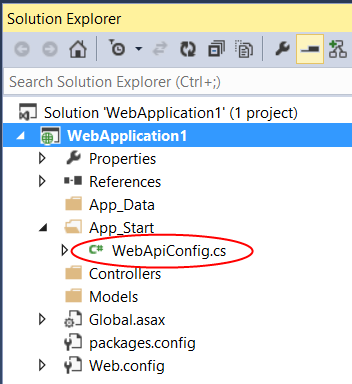 In an ASP.NET application, configure Web API by calling GlobalConfiguration.Configure in the Application_Start method. The Configure method takes a delegate with a single parameter of type HttpConfiguration. Perform all of your configuration inside the delegate. In Visual Studio 2017, the "ASP.NET Web Application" project template automatically sets up the configuration code, if you select "Web API" in the New ASP.NET Project dialog. The project template creates a file named WebApiConfig.cs inside the App_Start folder. This code file defines the delegate where you should put your Web API configuration code. The project template also adds the code that calls the delegate from Application_Start. If you are self-hosting with OWIN, create a new HttpConfiguration instance. Perform any configuration on this instance, and then pass the instance to the Owin.UseWebApi extension method. The tutorial Use OWIN to Self-Host ASP.NET Web API 2 shows the complete steps. The HttpConfiguration.Services collection contains a set of global services that Web API uses to perform various tasks, such as controller selection and content negotiation. The Services collection is not a general-purpose mechanism for service discovery or dependency injection. It only stores service types that are known to the Web API framework. The Services collection is initialized with a default set of services, and you can provide your own custom implementations. Some services support multiple instances, while others can have only one instance. (However, you can also provide services at the controller level; see Per-Controller Configuration. IActionValueBinder Gets a binding for a parameter. IApiExplorer Gets descriptions of the APIs exposed by the application. 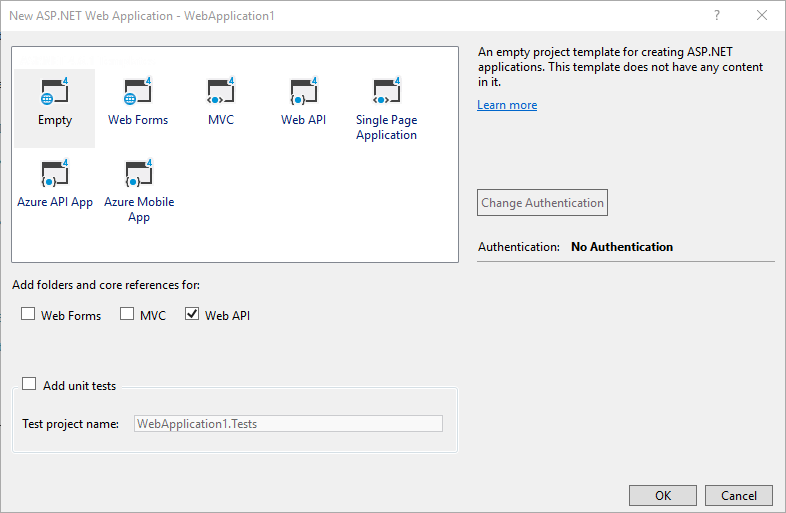 See Creating a Help Page for a Web API. IAssembliesResolver Gets a list of the assemblies for the application. See Routing and Action Selection. IBodyModelValidator Validates a model that is read from the request body by a media-type formatter. IDocumentationProvider Provides documentation for APIs. The default is null. See Creating a Help Page for a Web API. IHostBufferPolicySelector Indicates whether the host should buffer HTTP message entity bodies. IHttpActionInvoker Invokes a controller action. See Routing and Action Selection. IHttpActionSelector Selects a controller action. See Routing and Action Selection. IHttpControllerActivator Activates a controller. See Routing and Action Selection. IHttpControllerSelector Selects a controller. See Routing and Action Selection. IHttpControllerTypeResolver Provides a list of the Web API controller types in the application. See Routing and Action Selection. ITraceManager Initializes the tracing framework. See Tracing in ASP.NET Web API. ITraceWriter Provides a trace writer. The default is a "no-op" trace writer. See Tracing in ASP.NET Web API. IModelValidatorCache Provides a cache of model validators. IFilterProvider Returns a list of filters for a controller action. ModelBinderProvider Returns a model binder for a given type. ModelMetadataProvider Provides metadata for a model. ModelValidatorProvider Provides a validator for a model. To do so, define a custom attribute that implements the IControllerConfiguration interface. Then apply the attribute to the controller. The following example replaces the default media-type formatters with a custom formatter. The HttpControllerDescriptor contains a description of the controller, which you can examine for informational purposes (say, to distinguish between two controllers). Use the HttpControllerSettings object to configure the controller. This object contains the subset of configuration parameters that you can override on a per-controller basis. Any settings that you don't change default to the global HttpConfiguration object.